The global needle-free drug delivery devices market is consolidated with the top three players, Zogenix, Inc., 3M, and AntaresPharma, Inc. accounting for 61.3% of the market in 2014. These companies have a strong and wide product portfolio and emphasize on geographic expansion through collaborations and partnerships, says a new report by Transparency Market Research (TMR). Some of the other players in the market are Glide Pharmaceutical Technologies Ltd., Injex Pharma AG, and Pharmajet,Inc. The competitive rivalry in the needle-free drug delivery devices market is expected to become high in the coming years as players are increasingly investing extensively in research and development. Players are introducing their products in emerging nations to expand their geographic presence. There exists considerable threat of internal substitutes with low cost and biodegradable implants, but it will not affect the growth of the market as the number of substitutes is likely to be low. 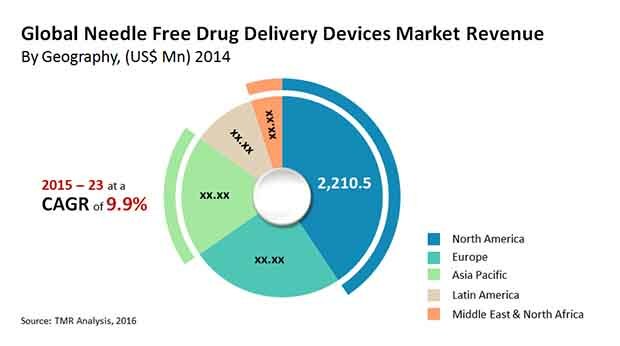 According to the report, the global needle-free drug delivery devices market is expected to be worth US$13,087.8 mn by 2023. On the basis of technology, the competing needle-free technologies segment will lead and be worth US$7,748.0 mn in the market by 2023. The segment will also expand at a significant pace in the coming years. By type, the novel needle technology will lead and shall be worth US$3,952.5 mn by 2023. However, the transdermal patch technology segment will expand at the most significant pace from 2015 to 2023. By application, the insulin delivery segment will lead and is estimated to be worth US$4,122.7 mn by 2023. The pediatric injections segment however, will expand at the robust pace in the coming years. On the basis of geography, North America led in the past and will continue to do so, and is expected to be worth US$4,973.4 mn by 2023. Asia Pacific is expected to expand at a double digit CAGR in the coming years. Needle-free drug delivery devices are designed to consider a patient’s requirements for self-administration and home-use. Patients, especially those suffering from diabetes find is stressful and painful to take doses of insulin every day and thus, patients are seeking safe, easy to handle, pain free, and cost effective novel drug delivery technologies. According to the World Health Organization (WHO), the geriatric population will reach up to 2bn by 2050. This is likely to fuel the demand for drugs to alleviate pain, improve quality of life, and treat chronic diseases. “Most elderly people prefer home health care devices and wish to avoid hospital visits, and this is favoring the global needle-free drug delivery devices market,” says a TMR analyst. The growing incidences of chronic respiratory disease, diabetes, cancer, and other such diseases where continuous drug support is required will ensure the continued growth of the needle-free drug delivery devices market in the coming years. Needle-free drug delivery devices require proper handling. If they are not handled properly, microneedle patches may break and could remain under the skin. This is one of the key drawbacks of these devices, affecting their demand. Another challenge facing the market, is the limitation in terms of range of applications. Thus, technical barriers related to needle-free drug delivery devices will restrain the growth of the market. On the other hand, while currently these devices are being used only for vaccine delivery, insulin delivery, pain management, and pediatric injections, this range will expand due to efforts by key players and create growth opportunities in the market.